Lovely and bright one bedroom apartment recently decorated with a great taste. 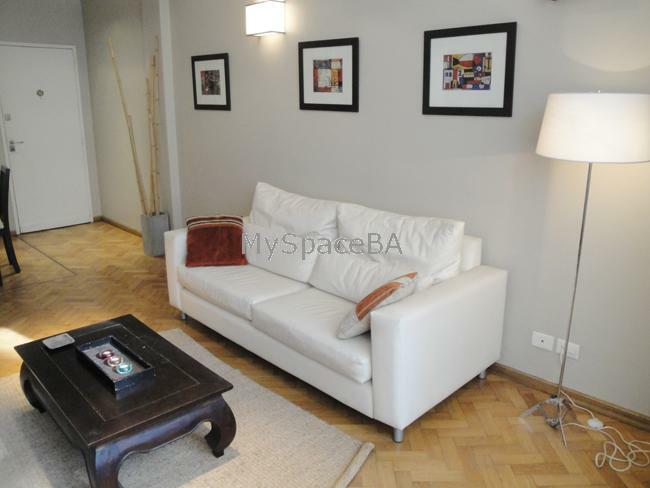 It has a great location, near the Botanical Garden, City Zoo, Las Heras Park also the subway is only 600 metres away. The apartment is situated at the back of the building. It has an ample living room with a comfortable sofa, cable TV, Hi Fi System , Internet . There is a dinning area with table and chairs. The bedroom has a king size bed and ample closet . Also it has a lovely balcony. The bathroom is complete with bath tub and shower. The kitchen is fully equipped. This is a very affordable option. Hardwood floor . Air conditioning . Heater . Landline telephone for local calls . Internet High Speed . TV with cable . Washing machine. Refrigerator . Freezer. Toaster, coffe-machine . Dishes . Included: Electricity, water, gas, building tax, city tax , Internet, cable.